Stay tuned for upcoming events for Brave 17 in near future. Brave Combat Federation is coming to Pakistan. The first ever International Mixed Martial Arts event in Pakistan will feature representation from 12 nations. Be part of the fight night featuring the biggest international stars, the Pakistani heroes and an exciting night of action and entertainment. Get your tickets now and be part of history! 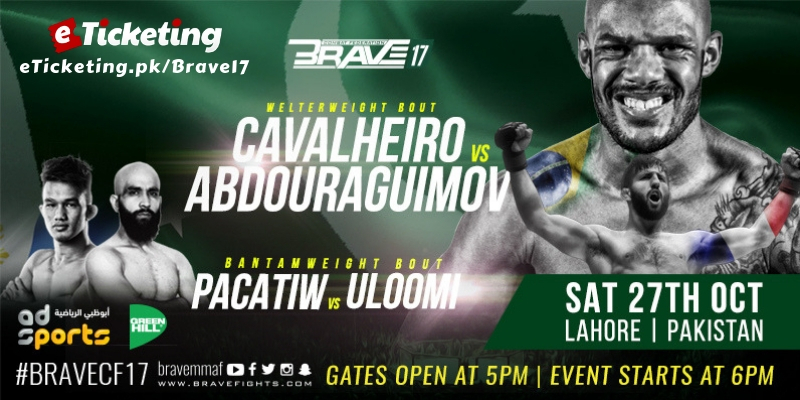 > Pakistani mixed martial arts (MMA) star Uloomi Karim Shaheen will be fighting Philippines' Jeremy Pacatiw in the co-main event of the Brave Combat Federation's Brave 17 event, set to take place in Lahore on October 27. The Brave 17 fight night marks the first time an international MMA promotion is staging its event in Pakistan, for which it will bring international stars but also use local talent. One of at least two Pakistani fighters on the card will be Uloomi, who famously defeated India's Yadwinder Singh in 2016, and brought his young sport some much-needed attention. Pakistan's Uloomi Karim Shaheen lands a blow on India's Yadwinder Singh in their 2016 fight. — Photo by Uloomi The fight against Pacatiw will offer Uloomi a chance to bounce back following his surprise defeat to Afghanistan Emran Tarakhil last month. That defeat had snapped a three-fight winning spree for the Islamabad native, who must be raring to put that setback behind him, especially in front of his home fans and at a high-profile event that Brave is cooking. "Fighting Pacatiw is going to be an interesting battle," Uloomi told Dawn. "Also, I can’t wait to fight in the prestigious BRAVE CF and that too on home soil. There’s going to be fireworks, guaranteed!" Meanwhile, the main event of the night will be a welterweight bout between veteran Brazilian Rodrigo Cavalheiro and Abdoul Abdouraguimov — an unbeaten prospect out of France. The swift rise Brave Combat Federation: A brainchild of Bahraini royal family member Khalid bin Hamad Al Khalifa, Brave was founded in 2016 but has swiftly gained traction in the fight circles and can already be regarded as perhaps the most notable MMA promotion out of the Middle East. It's international ascension has been just as remarkable, with the nascent organisation already having staged events in Bahrain, UAE, Brazil, India, Mexico, Jordan, Colombia, Indonesia, United Kingdom and Morocco. Moreover, in less than two years of its inception, Brave has seen its platform and facilities used by more than 250 fighters from 43 nations. Best Viewed at 1024 x 768 pixels and above. This Page loaded in 0.0651 seconds on Tue, Apr 23, 2019 (21:52).